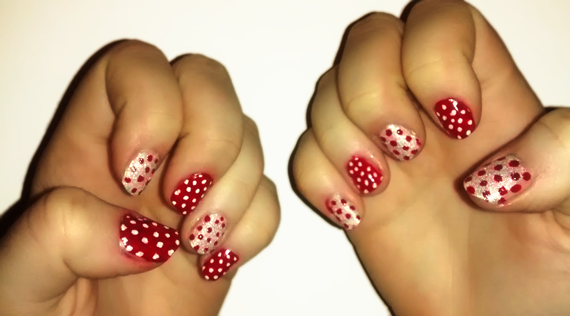 Todays our little sisters birthday and she asked me to do alternating red and white spotty nail art for her. I only used Barry M nail polish for these nails, I recently bought their white nail art pens and it was perfect for doing the white polka dots. I recently also bought Barry M Textured Nail Paint White Pearl Lady from Superdrug and it is a fantastic polish for this season, it shimmers and glitters like snow! I have some ideas I’m working on for some christmas themed nails with this polish now. I started these nail designs by painting two coats on alternative nails using Barry M Nail Paint Bright Red 262 which is a fantastic red shade. On the other nails I also did two coats of polish with Barry M Textured Nail Paint White Pearl Lady. To do the white dots on the red nails I used Barry M Nail Art Pen White 1, This pen is fantastic for nail design. The polish glides on like a pen and has quite a fine nib so that you can do fairly intricate designs. I only wish Barry M had a red pen! 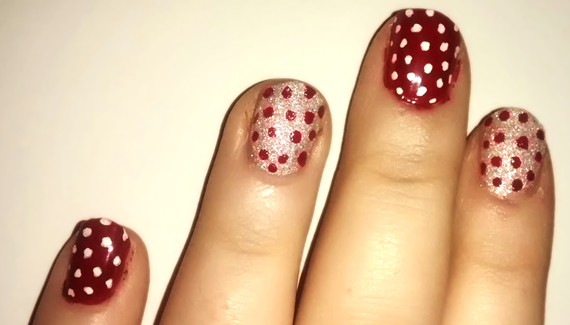 To do the red dots I used the Barry M Nail Paint Bright Red 262 and a nail dotter, bought on Ebay .